26 december, 2012 Säg något! 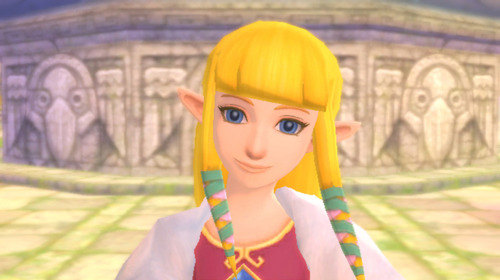 Me and my buddy Elden started to play The Legend of Zelda: Skyward Sword last night. We’ve decided to make our way through this game together and its actually very fun to play a Zelda game with someone who likes the series as much as you do. So we’ll only be playing it when he comes over to me, so no cheating! So far I’m liking it. Even if I can get a tad tired of the motion controls. They are good, but they didn’t have to use it for the damn bird flying. The fighting and everything else feels really great. And I do sometimes get the feeling that I really am holding the sword. Just look at her! She is so damn cute! I’m in love. And i really enjoy seeing Link and Zelda being all sweet together, well the times when they are together or have the opportunity to be sweet. But I don’t know what happens later on in the game. 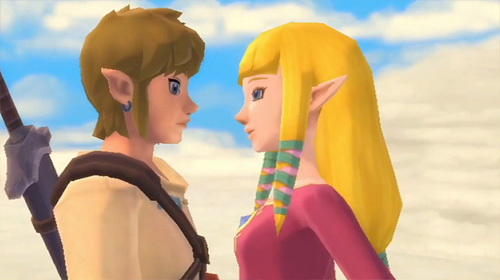 But so far I am loving the approach that Link and Zelda actually have feelings for each other. I do hope they go forth with this even more in the game and if they don’t, do not spoil it for me please? I’m eagerly awaiting the next time we’ll continue to play and it feels so good to feel the way I feel towards games right now, it’s just a feeling of love. And speaking of love, got any good tips on games with a good love story? I feel like I want to play something like that now. Don’t make a lady wait Link. Kiss her!